This bison is on the ceiling of a cave in Spain called Altamira. It was painted about 14,000 years ago. Not only is it beautiful, it seems to be charging. It is one of nearly a hundred figures on that ceiling, which someone has called the Sistine Chapel of prehistory. Most cave drawings are mere outlines but these are filled in with color that varies in intensity, giving them a chiaroscuro effect and even the look of volume. The artist also took advantage of the irregularities in the rock surface to make his figures or parts of them stand out in relief. He was a real master. Why did he paint the ceiling? Scientists wish they knew. The figures don’t make a nice composition like Michelangelo’s famous work. They are painted here and there and any which way, some facing one way, some another, in many sizes and scales. The artist seems to have chosen a free area on the ceiling and worked standing in the most comfortable way he could. It was pitch dark in there, remember. He had to work with a torch or an oil lamp. It is hard to imagine how he could have avoided covering the ceiling with soot. One theory is that the animals had a magic purpose. The artist painted them to scare up the game, as it were; though “game” is a silly word for those days when the hunt was no sport. Or perhaps he painted them to give thanks to an unseen Power for supplying him with food. It is hard to believe that he painted a pretty animal because he had the artist’s itch. Or because he wanted to adorn his bedroom. The chamber with the paintings is in a part of the cave where no one ever lived. Yet they are better than mere magic signs. They are based on close observation and streamlined in a way that only a great artist can do. Another mystery has come up recently. Scientists believe they have discovered that some of those figures were painted thousands of years after others. See that story at http://judithweingarten.blogspot.com/ (as well as other very interesting posts on art and history). A long dark Ice Age would have passed like a winter; and in the spring of a new Time, some artist tried to imitate the Old Master? 13,000 years ago a rock-slide closed the entrance and until 1879 no one ever went in there again. A hole opened up in the ground and a little girl ventured down like Alice in Wonderland. She ran to get her father, an amateur archaeologist. When he told the world what his daughter had discovered, no one would believe him. No prehistoric paintings like those had ever been seen. And they looked suspiciously modern. After a long debate the experts finally withdrew their objections and declared the paintings genuine. After that, people began to visit the Altamira cave in greater and greater numbers until the authorities decided to close it because the paintings showed damage from the moisture and heat that rose from the visitors. 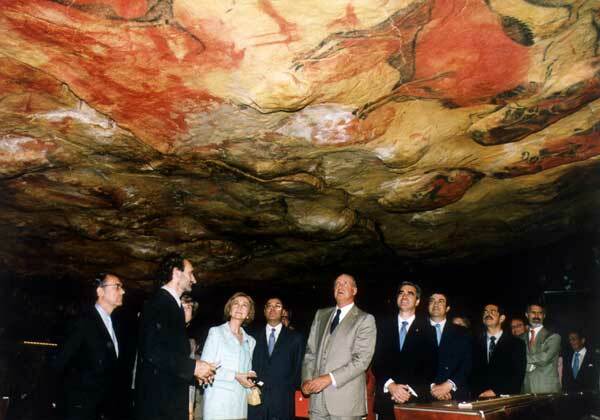 Recently the Spanish government inaugurated a replica of the cave chamber with the paintings. Here is a photo of the event, with King Juan Carlos and Queen Sophia. The ceiling figures are not the only ones in the cave. Here is a very large deer, 2.25 meters long, painted on the wall of another chamber. 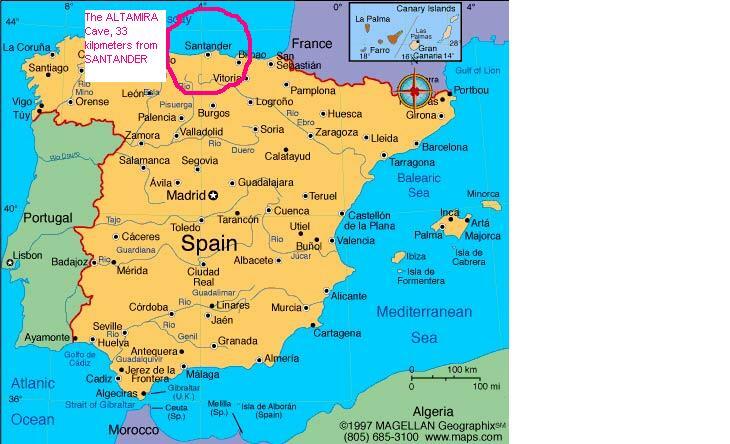 The Altamira cave, which the UNESCO has declared a World Heritage site, is near Santander, the capital of the Autonomous Region of Cantabria in the north of Spain. This entry was posted in art, art history, great artists, Spain and tagged Altamira, bison, cave art, cave paintings, deer, prehistoric art, Santander, Spain. Bookmark the permalink. Really, that bull looks charging, as you say, Swallows. Ken: Thanks. The artist obviously enjoyed doing these and had done a lot of drawing to perfect that style of his. Notice how he used the rock sticking out for a hip and a shoulder. He made the drawing to fit the rock! Also how the black stands for the bison’s curly hump-fur and rump as well as those fine hooves. Notice too the wonderful curve of those simple horns and that lifted tail! Artist’s itch it was. Rich: They say you have to give the poet and the painter credit for everything you find in their work. The writer too. Well, I’ll take it but I never thought of those clever things you say. Funny and nice. Actually–which is it? Is the bison a cuddling embryo or a hot charging beast? I never knew either they were this large. Only a highly skilled and experienced artist could paint such beautiful images on such a large scale. I’m very impressed by the rock being used for a 3D effect. It looks like a conscious decision, being used over and over. Many other cave paintings are very simple, with no artistic merit. 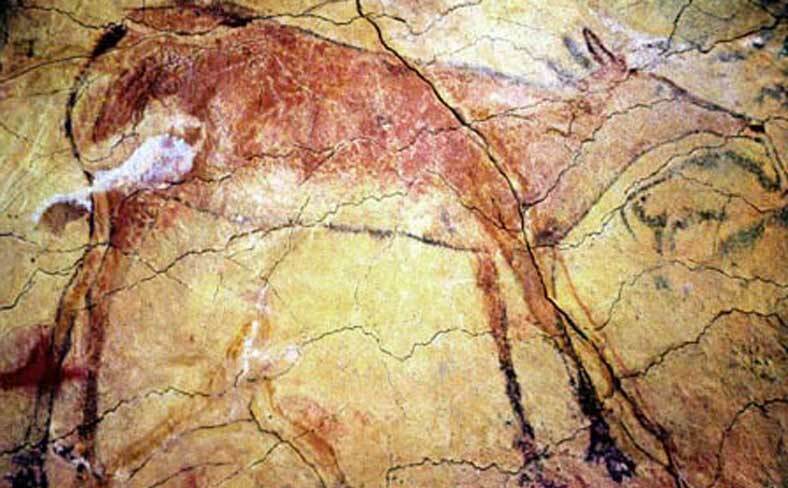 Art was born in Altamira and Lascaux. Artist’s itch it was I think, in particular for the charging bison. This one really seems much advanced over the others shown here: capturing dynamic movement of the bison and not just a standing still profile; elegant lines in tail and horns; and something I just noticed, managing to have various limbs overlap one another, e.g. legs over the torso. This last one is striking. It really adds to the three-dimensional aspect of the drawing. I had first thought “artist’s itch” was a humorous way of saying that the desire to make art really didn’t come into play here. But the more you look at it, as 100swallows says, you have to think that there was an element of “artist’s itch.” It’s always fascinating trying to get into the minds of our distant forebears. But could the artist have been a she? has a curious post about Wilma–a modern reconstruction of a Neanderthal woman. Scientists have made her strong. They say she probably even took part in the dangerous hunts. If that was so, her life was much harder than a man’s, much busier. Having children and caring for them was just another of her jobs. You would think an “artist” needed some leisure time to muse and to practice drawing. Where would she get any of that? Even if she had the inclination, which is also unlikely. I have thought about this art for over 40 years. I have no great revelations as a result of all this thinking. I do think that we may never be able to fully understand these artists though. The people that created these fantastic pieces could be said to be creatures on a cusp of becoming what we think of ourselves as. They were just inventing a technology of a scale that would lead to them becoming utterly differentiated from animals. They were leaving Eden. Imagine what it is like to be an element of an ecology. A creature browsing for food. Food that was everywhere you looked. It may not have been exactly easy to acquire at all times, but the very fact that you were there was because you were part of the environment and as such you ate what was right at hand. There was no there there. You ate, slept, explored, mated and died. As the ecology changed you changed or died. There wasn’t really a “you” either. When we think of the ocean do we think only of water? The ocean is water, sea plants, sea animals and so much more. The land is the same, or at least it was for so long. At some point this began to change. Our ancestors fell into an amazing feed back loop. An incredible tornado of thoughts and technological creation, begetting more thoughts, begetting more creation. Individuals became. The land became a place, a there. A landslide of conscious differentiation led to identity and naming and joining and splitting. I’m not a mystic but this era may well have been over ripe with mysticism as chaos became real and then it became describable, as sunsets became something to see, storms created awe, seasons shouted of the universe and beauty bled from our earthly womb. I still cannot imagine why this great art was created, somehow though I feel it was for something far different than good luck hunting. I would suppose that some are born with the abliity to produce great visual works without formal training. Years ago there was a documentary on this man who could not function on his own in his 20’s and had to be taken care of by his mother. He could, barely, function as a janitor. In the program she took him to the zoo where he looked at a Rhino with her baby. He looked at them for about 20 minutes then went home and sculpted them in clay – very natural, very accurate. The work sold for $40,000. I could not understand why the mother let him work as a janitor. I would have had him at the zoo daily. PS. Why are you quoting that blithering idiot Spaniard? Probably the Paleolithic people were even more programmed in this way. Conclusion: it is probably impossible for us to imagine what went on inside their murky heads. Fear was everywhere. Tradition was tyrannical. Bill: Remember that these bisons aren’t just accurate renderings but artistic interpretations. I’d like to see the $40,000 drawings of that mentally challenged kid. And it’s true, I know many people who read that Picasso quote will think: Right—you ought to know about the decadence. You contributed your share. Why do you keep referring to the artist as “he”? Do you have some reason to assume the artist was male? Picasso not only found his inspiration for cubism in the Spanish Paleolithic cave of Altamira but also transferred the metaphor of the mare to his Les Demoiselles d’Avignon.